Derby's waste - a rubbish blog ! : Would you like flies with that? Derby's waste - a rubbish blog ! A blog by Simon Bacon - waste and anti incineration campaigner relating to waste management by the councils of Derby and Derbyshire in the UK. After a number of years use and ownership by Transcycle - including acting as a hub for the city of Derby's brown bin recycling scheme where garden and food waste was bulked up for shipment to Vital Earth at Ashbourne for composting number 201 Slack Lane in the New Zealand / Mackworth area of the city was placed on the market. The community have had issues with the site in the past as sited in an inner city area odour and fly issues were always likely to be on residents minds. 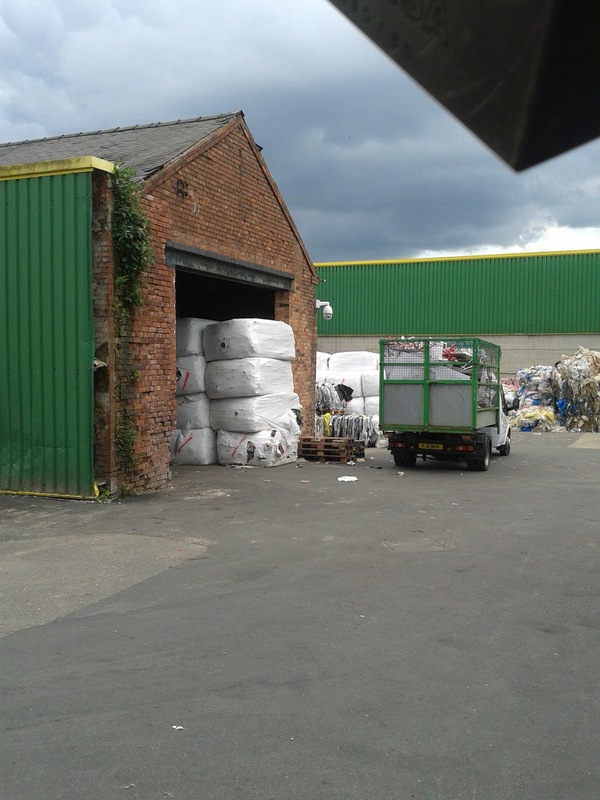 Few likely noted the small article in the Derby Telegraph in the late summer of 2015 reporting that a new company was moving to Derby from Nottingham and was known as Go 4 Greener Waste Management. Taking on the 2.6 acre site the company owned by Wayne and Sam Turton was described as a business providing a range of recycling services. Deeds logged with the land registry indicate the Turton's are owners of the site having paid £850,000 in July 2015 with the support of Barclays Bank. While described in the media at the time as offering recycling services the companies website talks of zero waste to landfill - which to those in anti incineration circles means sending waste to incineration plants in either the UK or Europe. 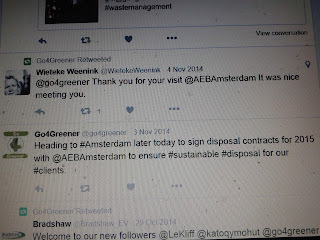 The Go 4 Greener twitter account in the past made reference to agreeing waste disposal contracts with AEB Amsterdam - a major incinerator of waste so it is clear that the company does not just handle specific recyclables but clearly has an interest in waste of a more residual nature - but then that needs to be shipped in some fashion to the likes of AEB Amsterdam. 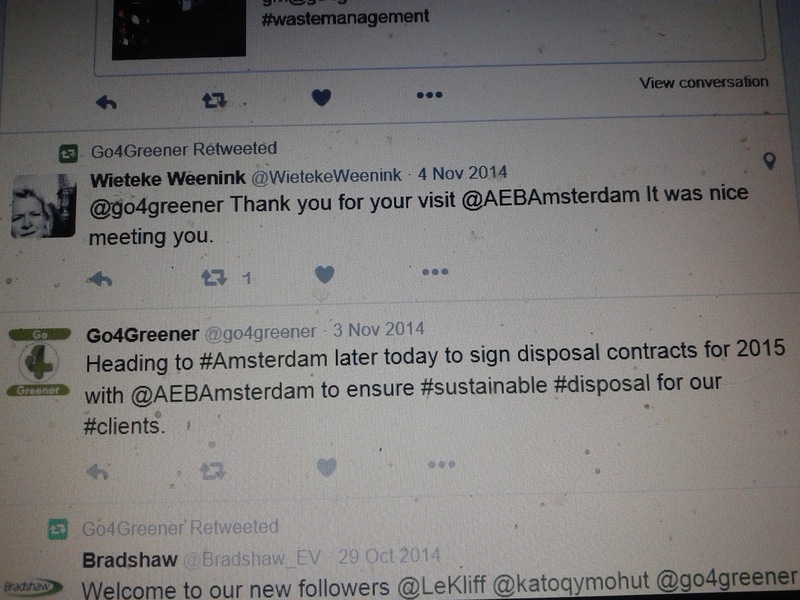 Tweets from 2014 show their engagement with AEB Amsterdam. This then brings us to the issue that has unfolded in the streets and homes of the Mackworth community in recent weeks and months. While buzzing along under the radar for some time in recent weeks a serious fly outbreak has blighted the community bringing misery and distress to all around including major impacts on the Kingsway Retail Park leading to store closures. Many pages of the complex story of what has happened and who is to blame have been printed or reported in recent weeks with fingers being pointed in different directions by different parties. Without a copy of the waste permit it is not possible to identify what the site should and should not handle but what we do know is that the waste permit itself is registered not to Go 4 Greener but to another company owned by the Turton's known as Shows Waste Management which was launched in 2015. Waste permits are the life blood of a waste site - it is what allows the process to take place and these permits are issued by the Environment Agency. 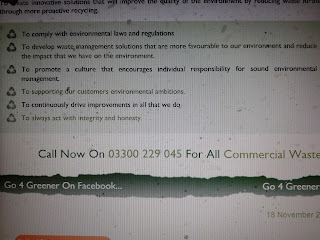 The Turton's via the media appear to be suggesting that the issues relating to the flies on the site and the surrounding area are due to who they call Envirofuels / Trent Valley Recycling who it is claimed they leased part of the site to although the media report that the companies in question deny these claims. The facts with this situation are all pretty murky as to who is responsible for the waste in question but suggestions are circulating that issues with the site were raised at a residents meeting as far back as February 2016 and if this is the case potentially dates back beyond the involvement with these companies. This is backed up by the fact the Environment Agency issued an order against Shows Waste Management on March 10th 2016 which is before Trent Valley Recycling signed the agreement to use the site. This has led to the site being filled with large bales on the site of what could potentially be refuse derived fuel - known as RDF - shown below. As to what the bales actually contain and their intended destination if they are in fact RDF bales then they could have been produced by either one of the Turton's companies - noting their connections to incineration plants in Holland or that of fledgling company Enviro Fuels Solutions Ltd who appear to be the company the Turton's are referring to. What is becoming clear is that neither Derby City Council or the Environment Agency are making Shows Waste Management deal with the waste in the time scale locals need to get the fly infestation under control. In recent days a representative of the Environment Agency on East Midlands Today appeared to be implying that in part the issue was linked to homes being built around the site but anyone who knows the area knows that many of the local homes date back decades and in some cases around a century. 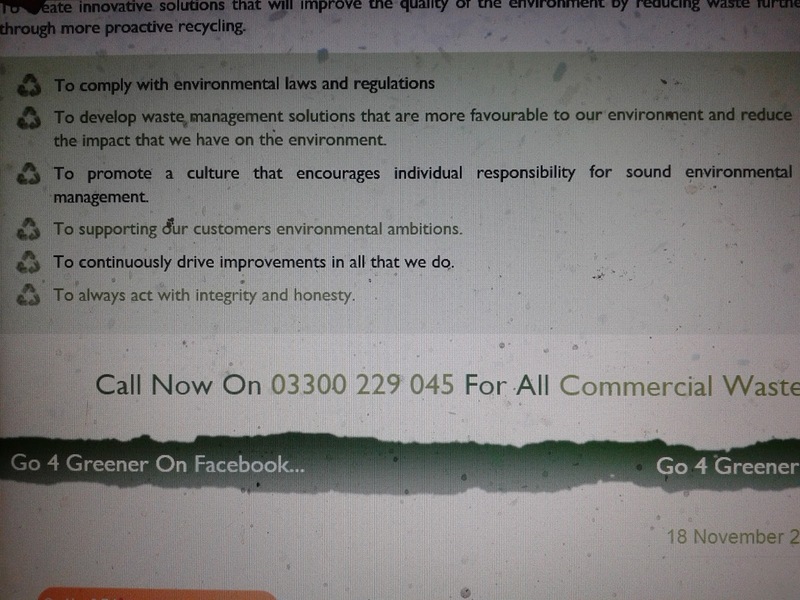 The Go 4 Greener website makes some grand claims about the companies ethos so lets hope they stand by them in the coming weeks and deal with the situation that is playing our in the city of Derby. There are many unanswered questions in this terrible situation but one that makes you stop and wonder is the following. If you run a waste company and have spent £850,000 on a site and you have an active waste permit in your companies name placing you in the position of overall control and therefore liability why would you risk your business by allowing the serious situation to develop on the site which is now causing such local distress and directly placing your business and family life at risk? If as suggested in the media there is 5,000 tonnes of waste that needs to be landfilled based just on the landfill tax rate of £84.40 the Turton's face a bill of over £400,000 for disposal of the waste mountain. The latest twist to the saga is that the Environment Agency have started legal action against companies on the site in relation to the waste. How this will pan out is anyone's guess but things need to improve soon for the good of the local community.